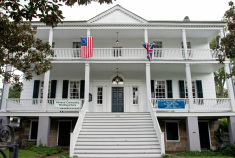 The Bellamy Mansion Museum has joined with area historic houses to provide unique historical experiences. Visit three historic homes at a discounted admission price with a purchase of a Passport ticket for $30.00. Tickets are good for one week from date of purchase and may be purchased at any of the sites. Holiday hours, especially in December, impact the sales of Three House Passports, so please call us or one of our partners for more information. Step back in history to 1770 and see this beautifully restored townhouse furnished with period pieces. Open for tours in 2019: Monday-Saturday, 10:00 a.m.-4:00 p.m.
​The last tour begins at 3:00 p.m.
Wilmington before the Civil War. Please visit their website for current hours. Private tours may also be arranged with 24 hours notice. Seasonal availability - Poplar Grove is only open on Saturdays from December-February. Please call us or Poplar Grove if you have any questions. Visit two historic homes at a discounted admission price with a purchase of a Town & Country ticket for $20.00. Tickets are good for one week from date of purchase and may be purchased at either site. Poplar Grove Plantation was in the same family for over six generations. Tours offered on Saturdays Only in November, January, and February. Tours offered Mondays – Saturdays in March, April, May, September, and October. Tours offered Mondays – Saturdays in June, July, and August.